My role at the Snowy River campus is Campus Principal after previously being Curriculum Coordinator. A significant part of my role is to ensure the smooth running of our campus on a day to day basis. I have the privilege of working with some of the most highly motivated and inspirational teachers on the planet and take great pride in being a driving part of an organisation and program that continues to be a leader in experiential education. At the Snowy River Campus my job is Student Health and Wellbeing Co-ordinator, but I also organise the staff and student rosters and teach across the curriculum. My role at SRC is as a generalist teacher. I work with various teams of students throughout the year facilitating and guiding their growth from teenagers to young adults. I find it extremely rewarding to witness the personal development of the students during their time here. I am a young and enthusiastic teacher who is passionate about working with young people and supporting them through their exciting leadership life changing journey here at the Snowy River Campus. I encourage people to find their 'zest' for life and to work hard at always keeping a positive mindset in all aspects of their life! My family has lived in Far East Gippsland for the past eleven years. I love the variety of outdoor activities that are on offer in this temperate, coastal environment where the ‘Mountains Meet the Sea’. It has been a privilege during the past two years to work as a teacher at the SRC amongst like-minded people who have a passion for adolescent education. I am passionate about educating young leaders in alternate settings after gaining experience working with year 9 students on King Island. I have then continued to develop my skills and knowledge with the School for Student Leadership over the past 4 years. At the Snowy river campus, I started my job as an overnight supervisor in Term 4 2013. Being relatively new to the position, I have enjoyed getting to know the students and the staff at the campus. As one of the generalist teachers here I am passionate about working with teams of students on leadership, teamwork, community participation and personal development. My role at the Snowy River Campus (SRC) is Office Manager, although most students consider me the ‘mail lady’. I am one of several enduring inaugural staff members of the school when it opened in 2007, and I still look forward to working with the professional, passionate and inspiring staff at SRC. I am the head chef at the SRC. I love to cook for the students, but spending time with them and working together is the real joy in my position. I am a generalist teacher here at the School for Student Leadership. Having studied a Bachelor in Outdoor Education and a Graduate Diploma in Education, I have worked with young people for over ten years in various settings. I value building positive relationships and supporting young people through their ‘rite of passage’. l am one of the Overnight Supervisors and l have been at this school since it opened in 2007. I enjoy like playing games like chess or cards with the students, as I think this is a great way to interact and get to know the students’ better. My wife and I have moved to East Gippsland in 2012 to live and work. I am enjoying being a part of the great teaching team and learning environment of the Snowy River Alpine School. I’m employed by the Snowy River Campus as the Catering Assistant. I enjoy cooking for our students and inventing new and economical meals. I am one of the overnight supervisors having commenced work with the school community term 2, 2012. Being relatively new to this position, having spent most of my working life in administration, I have found the Snowy River Community way of life to be an exciting, adventurous, challenging but refreshing journey. As a child growing up in Papua New Guinea I was fortunate to have had many experiences which has helped me to develop an interest in the outdoors and in the environment. Many years later, after having followed life’s many twists and turns, I have found myself fortunate enough to be able to contribute to the learning community at the School of Student Leadership. I am an enthusiastic educator who believes in the positive effects of experiential education and gaining ‘skills for life’. I have a strong interest in many outdoor activities and the environment, and thoroughly enjoy utilising the outdoors as a classroom in my teaching. 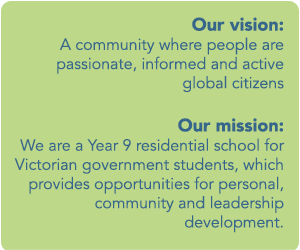 I feel very fortunate to be working at the School for Student Leadership and thoroughly enjoy assisting students to get the most out of their Snowy journey.